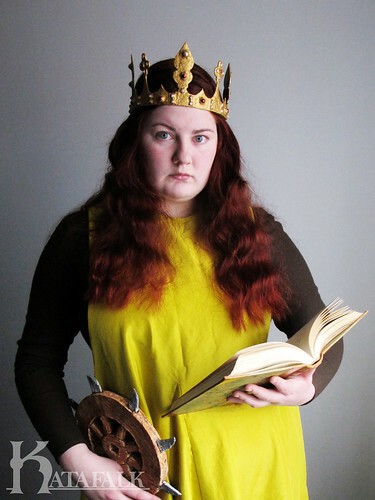 My Patreons have decided, here comes the post about my Catherine of Alexandria! In Fraternis Militia Carnis we some times hold a carnevale. 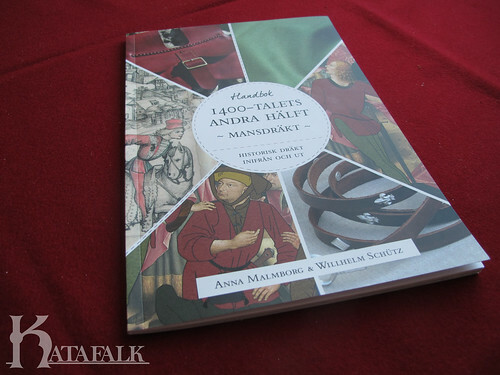 A medieval feast with medieval dress out. It is fun with games and as usual with Carnis there was a lot of good food. My first year as a trial member of Carnis was 2016 and that year we held a Carnevale at our annual meeting. 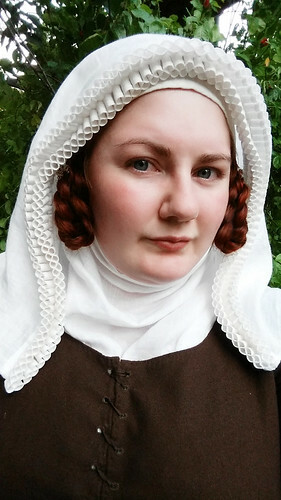 It was a bit hard to come up with an outfit that fitted, what did they dress up like in the 14th century. In the 16th century there are a lot of pictures but for 14th, not so much. So I decided to dress up like a Saint. 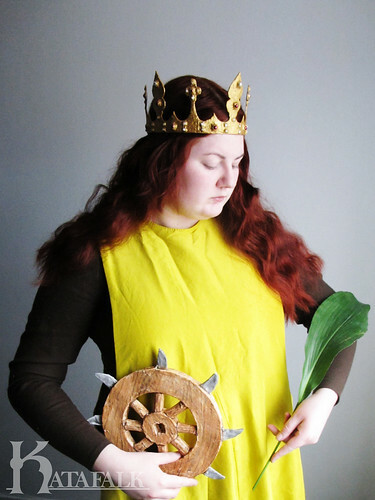 To be specific; Catherine of Alexandria. There are some photos on Carnis blog of me and some of the other members, an amazing deer for example! Click Here to go to it. 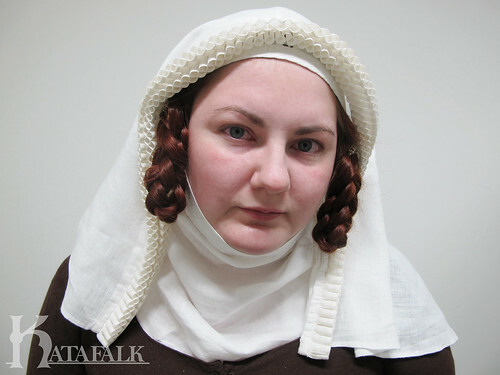 If was mostly because my name is Cathrin and there would not be that much work in fixing a costume but also because she was a very popular saint during the medieval era. She is often depicted dressed very finely with gold and a crown as she was a princess. 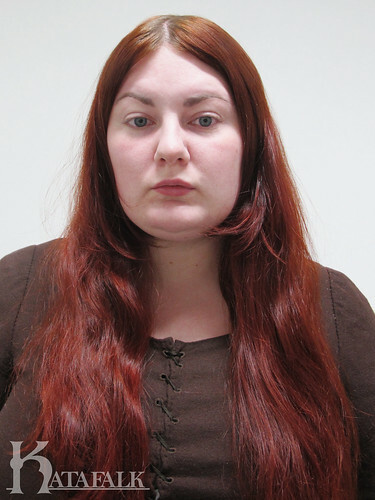 As she was unmarried when she died she is often shown with loose long hair. 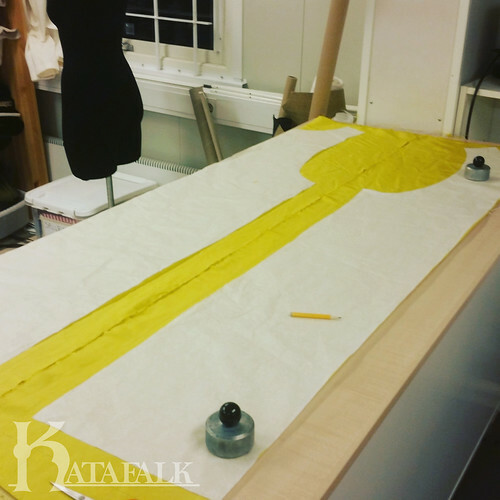 So I needed a fancy overdress, so I choose to make a silk side-less surcoat in yellow as I would probably get use of that later on. I lined it with a thin wool to make it fall nicely. 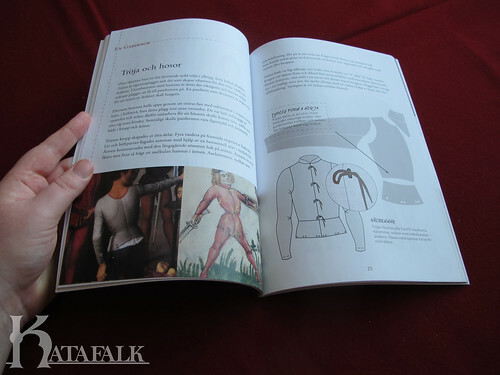 I have blogged about the side less silk surcoat before. Check it out Here ! It comes with a pattern. Then I needed a breaking wheel. 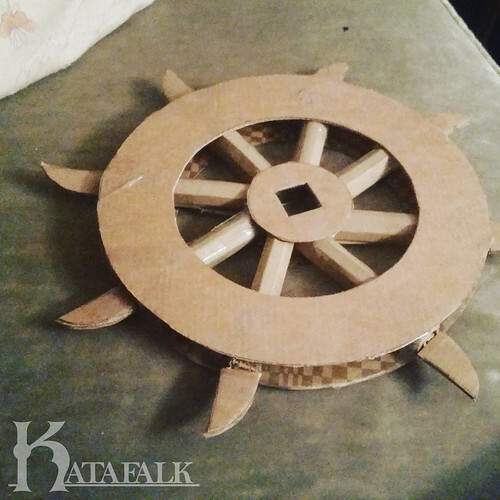 It is often shown as a very big wheel, but I decided to make it smaller and also as it was “only” for dress up I made it out of an old cardboard box that I covered in newspaper and glue and then painted to look like wood. Small, light and portable! On to the crown. Here I was at a loss. 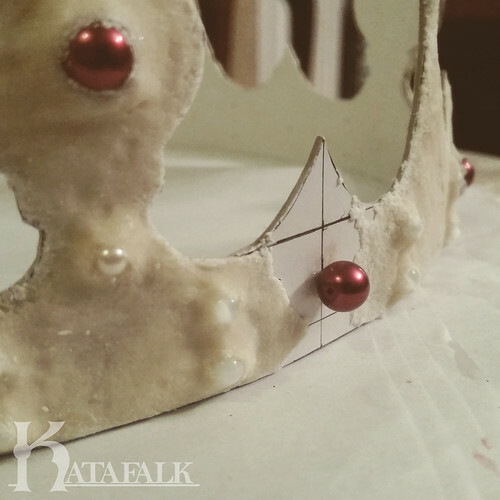 How to make a medieval looking crown, but not spend tons of money on it but not having it look like a paper crown that you had as a child. Then it hit me, as I kid in Sweden I played a lot with salt dough. it is cheap as it is only salt flour and water. It air dries and if fairly easy to work with. 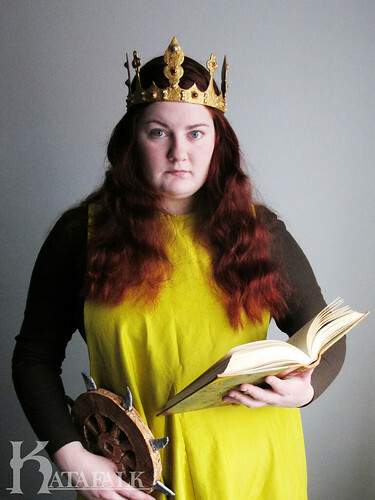 I started out with cutting a base of thick cardboard and based the shape on several medieval crowns. 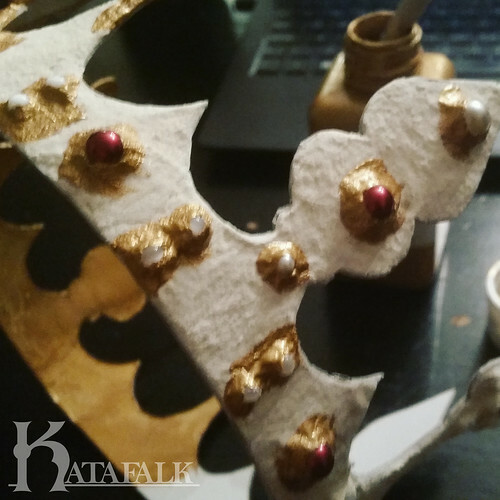 Then I glued beads onto the cardboard, as a crown needs gems. Then I covered it all in salt dough. It shrinks a bit when it dried so I had to touch it up a bit but it worked fine. Then it was all covered in golden paint. I did my best with the “martyrs palm” I got the only big enough green leaf at my local flower shop, some times you can not get it all. In about a month we have a new carnival coming up and I have yet to decide what to do, but I have several ideas on things that might be good. You will of course see it as well, in the end. So a new year is here! 2018! And I have big plans for this year regarding Katafalk. 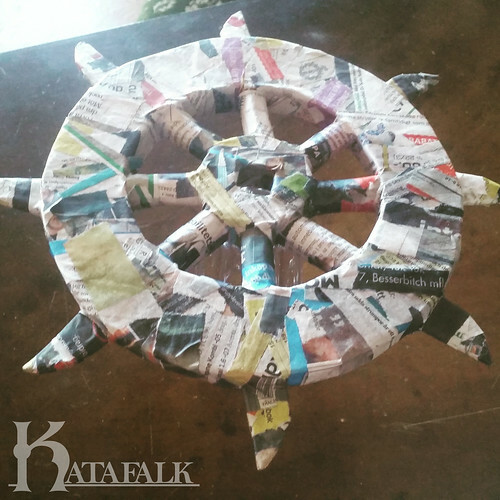 Late 2017 I took the step making Katafalk into a “real company”. So I am going to open up my Etsy again and make it more active. I have also decided to start up a Pateron page. This will not affect my blog at all in a negative way, but I hope that it will make me post more regularly on Worpress. All my content on my blog is free, and will always be free. I will not be making Patreon only tutorials, but there will be some perks for those of you who joins me over there as well. Many of you might not be familiar with Patreon. It is a subscription service that helps Creators to create more or better content by the help of its followers. It is crowdfunding like Kickstarter or Indiegogo, but in stead of one big project it is focused on the continuous creative process. Either by a monthly fee or a fee per smaller project. These fees differs from creator to creator and there are often a few different levels that you can choose from, each level having it’s own reward of some kind. So if you like what I do, pop over at my Patreon and check it out. Perhaps you want to join or it might not be you thing at all. Just know that the blog will not be affected in a negative way at all by this, it will if anything be more active and regular than ever with the help of this. 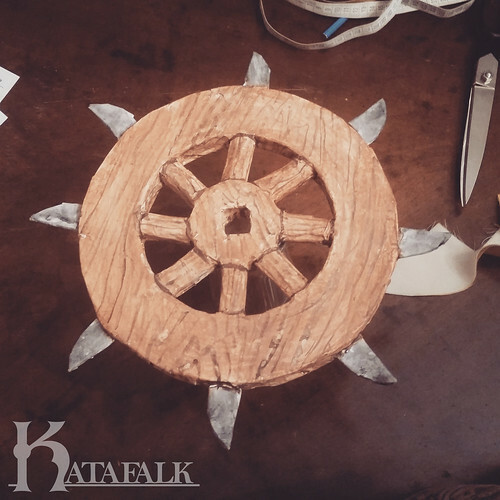 Check out Katafalk on Patreon! 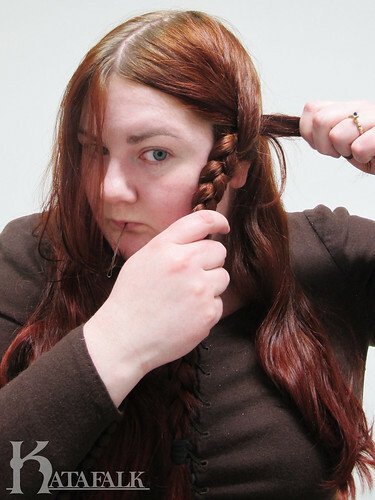 This is a tutorial for when you have long hair, but have that pesky bang that is long enough to braid in, but when braided in and your braids are doubled sticks out in the worst places. You can of course use this when you have a shorter bangs than I do. Start with brushing your hair out and parting it. 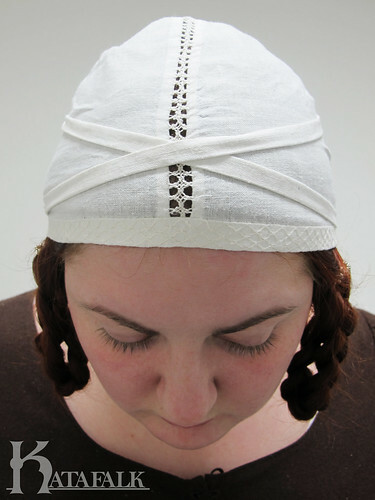 The part does not have to be super neat, as you are putting both a linen cap, veil and wimple over it. But you still want it to be kind of even, so that your braids does not end up with braids that look different. 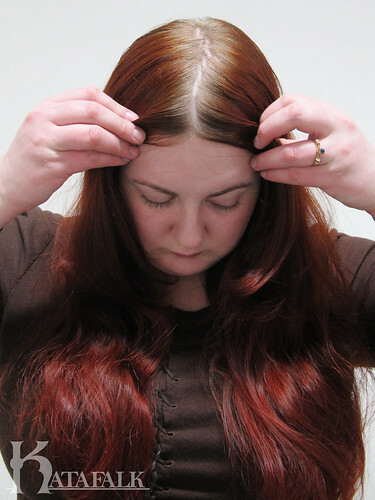 Separate your bangs from your lengths. 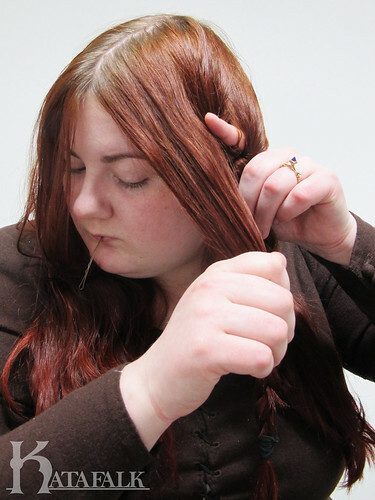 If you have a lot of hair like me, using all the hair in your braids can make them a bit to fat. 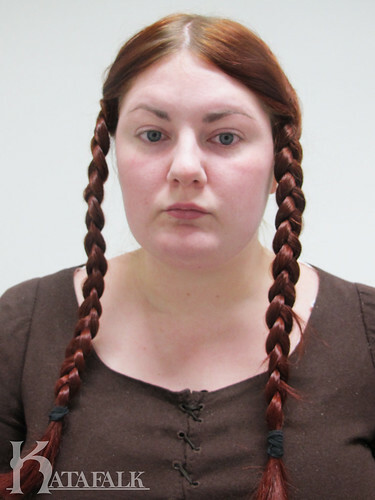 So I divide the lengths, two thirds for the braids and one third that will be put up in the back. 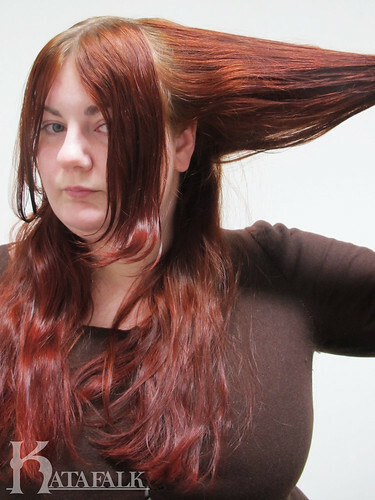 You might want to try different ratios out, depending on how much hair you have. If you have less of a mane you can skip this part and use all your hair in your braid. At this stage I put my bangs up, to make sure that they do not get into the braids. 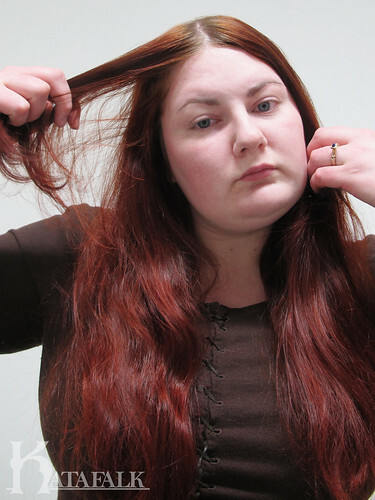 If you have lots of flyaway hair you can either add some coconut oil in to your hair, or some kind of hair wax. I use a organic hair wax that smells slightly of oranges. 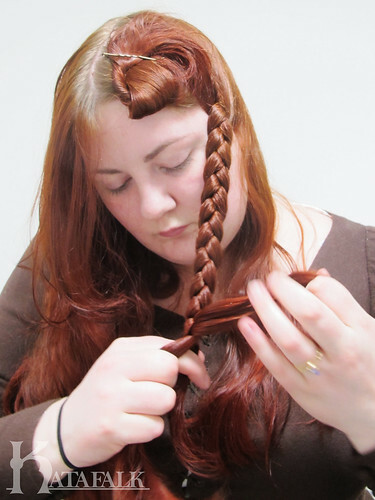 This will give you smoother and pretty looking braids. 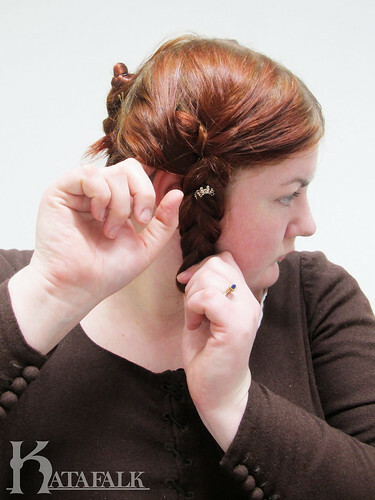 Now lets start the braiding, I do a simple three strand braid, making sure to pull the braid forward when braiding. If you braid them straight down, they will lay to far back on the side of your head. You wan them to be placed right in front of your ears, because hearing seems to be unnecessary for a lady. Secure the ends with a hair tie of your choice, I cheat and use small rubber bands. 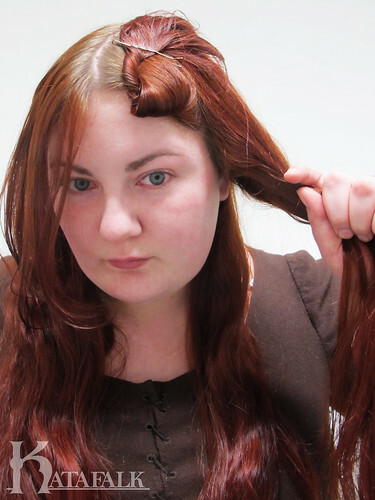 Pull your bangs trough making sure that the bangs are smooth and pretty. Secure the bangs in the back with a hairpin, making it look as if those bangs are smoothly braided into the braid. Rinse and repeat and do the same thing on the other side. The look of absolute boredom is optional. 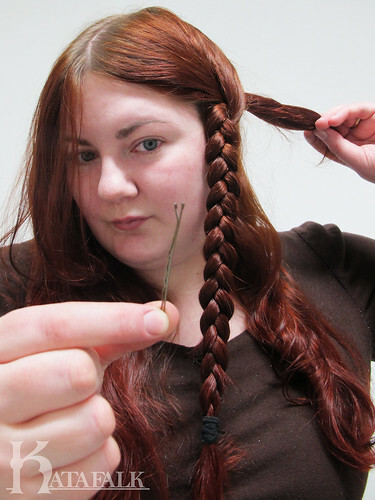 Double your braid and fasten it using a big U-hairpin. I have a fancy silver replica of the London findings. 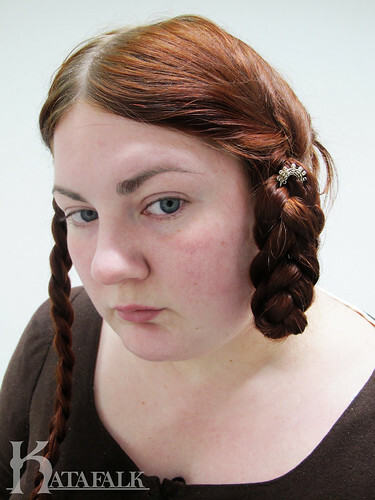 I usually put the hairpin in straight, this will make the braid look a bit crooked. 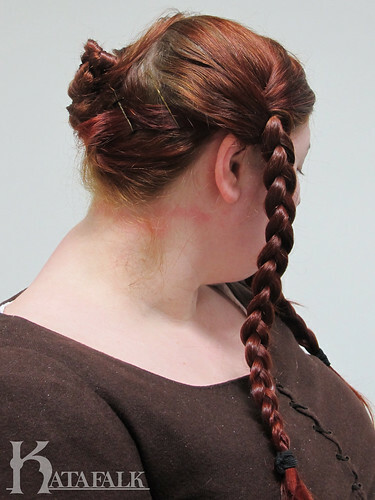 Then bend the braid so that it becomes straight again. Poke the ends of the braid in. At this point you can add whatever kind of headwear you want. 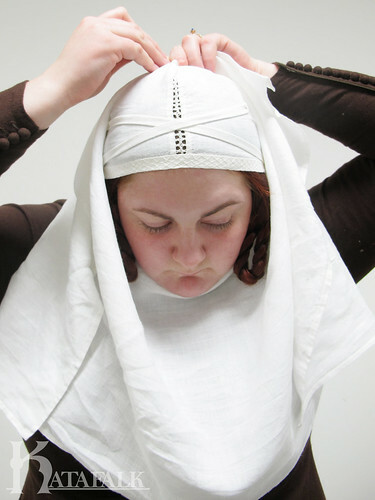 as long as you cover the back of the head as you have used modern hairpins. I will show you how I wear a frilled veil and wimple. So lets start out with the linen cap. 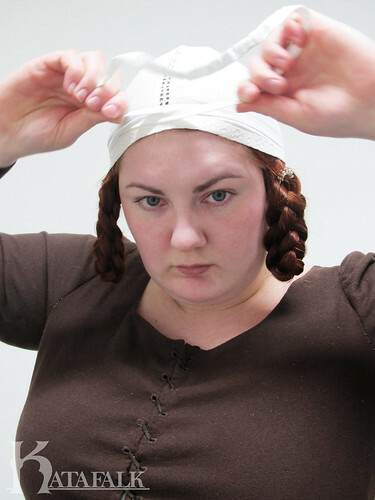 Centre the cap on your head and tighten it with the ties, crossing the ties in the nape of your neck, then pull them up and cross them again at the top of your head, and lay the loop around the back of your head. I use a rectangular wimple with the measurements of 150*60 cm. 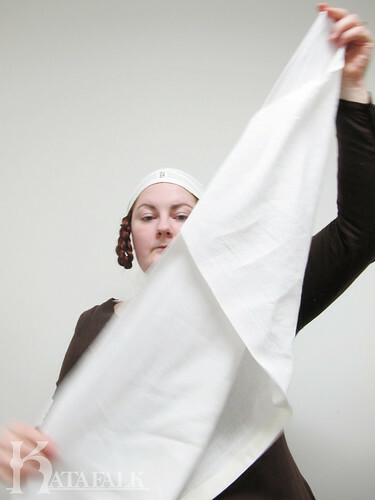 It is of a weight that matches the veil I am wearing and is hemmed at all sides with a small double folded hem. Centre it under your chin, making sure that the braids are on the outside. 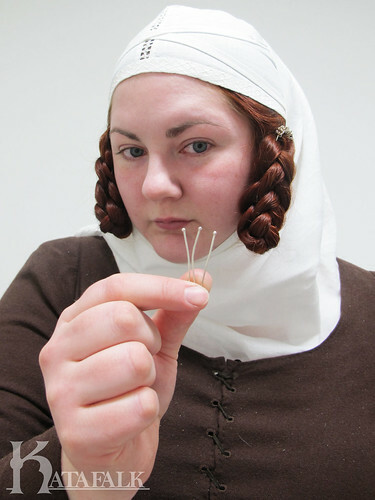 Pin the wimple with a needle at the back of your head. If you are short on reproduction pins, use a modern pin here, as this pin never will be seen. I some times also pin the wimple shut in the back with one pin, if it is a windy day. 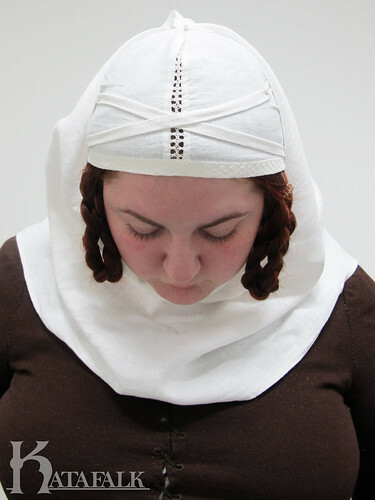 You can choose to wear the wimple on the outside of your dress or inside, this is a matter of personal choice. I usually wear it on the inside and secure the neckline with a few pins. I pin them so that they are not visible from the outside. Now lest bring out the pretty reproduction pins as they will be visible. I have these silver pins that are 4cm long. It is a length I like. If they are shorter than that I find them to have a tendency to slip out. I have a love for half circle veils, this one is 100cm long and 70cm wide. Onto the straight edge, my small starched frills are attached. Centre the veil on your head. Put a pin at the top of your head, make sure to catch the linen cap. You want the veil firmly attached to your head. Pin the veil at the sides as well. Now make sure to also catch the wimple. If it is a windy day you can also put a pin at the back of your head, at the nape of your neck. 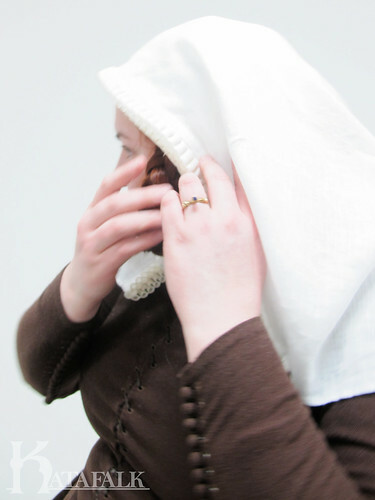 Veils have a tendency to not behave in the wind and flip over into your eyes. And now you are done! Go forth and be fancy! 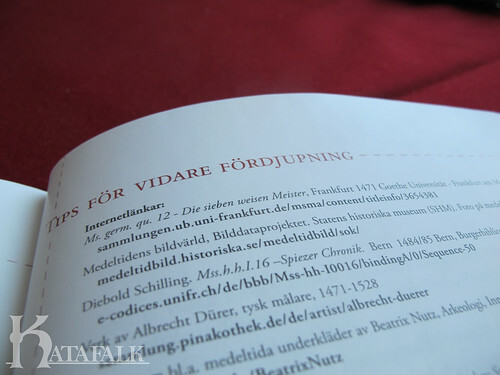 För denna beskrivning på Svenska; klicka här! A lot of people find setting sleeves to be the hardest part about sewing. 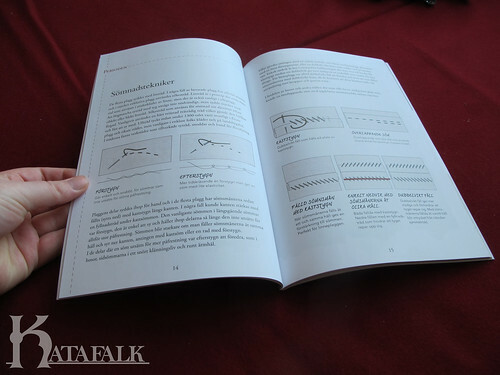 That is why have made this small troubleshooting manual to make your future sleeve setting a bit easier. It is written from the point of getting a “god looking sleeve”. One should note that a good looking sleeve is not always a historically correct sleeve. Some creasing and pulling is accurate and you have to decide on either pleasing your modern eye or your historical and also choosing between form and function. There is no way of you always getting both pretty and functional. This guide is written so that you will understand what is happening with your sleeve and what you can do to make it more visually pleasing, or to choose the more historical sleeve that will often times give you more movement than the modern sleeve will give you. The sleeves will be shown from straight ahead and from the side. It shows what is happening with the sleeve on the body with the pulling and creases that might appear. The sleeve will also be shown flattened as a pattern piece, both as a sleeve with the seam under the arm. but also as a historical s-sleeve. 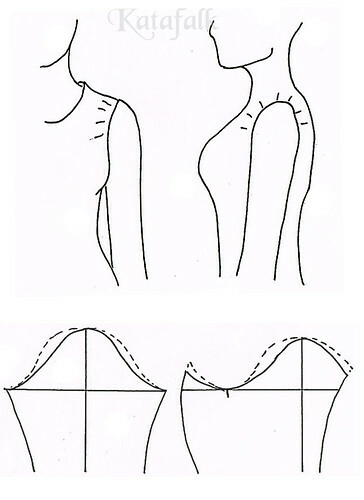 The solid line shows what we are starting with and the dotted lines shows how a “correct sleeve” looks in comparison. Note that a “correct sleeve” in this case is the more visually pleasing sleeve. The most common mistake people make when setting a sleeve is to have an incorrect armhole on their garment. 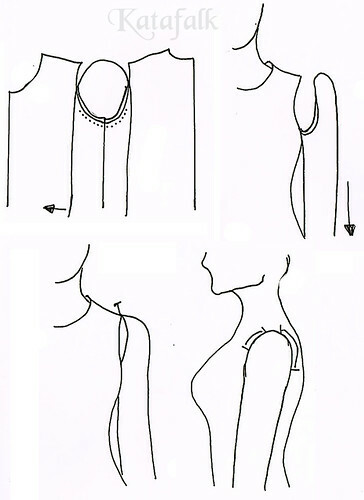 On a modern garment the armhole is often big, the bottom of the armhole is at the bust point and the sleeve seam is places a bit out on the shoulder. 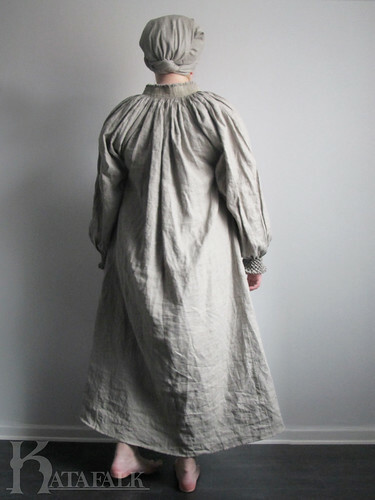 A historical armhole is always smaller, it is first when they started to sell ready made clothing that they had to make the armholes bigger to make the clothing fit a bigger range of people. How high the sleeve sit under our arm is very important to make sure that you get a good range of movement in you garment. 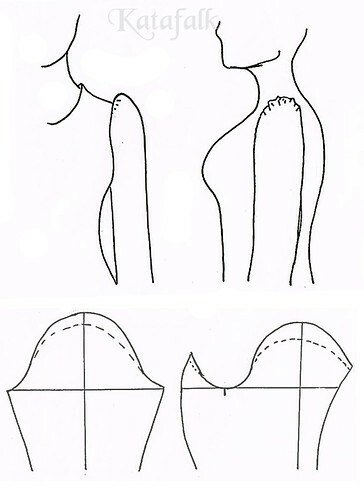 A lover armhole as shown as a solid line on the picture below will “lift” our entire garment when you raise your arms and you will get the feeling that there is a limit, you can not lift your arms higher. You can also get the feeling that he you lift your arm the seam will be pulled of your shoulder and it will pull both at the shoulder and armpit. 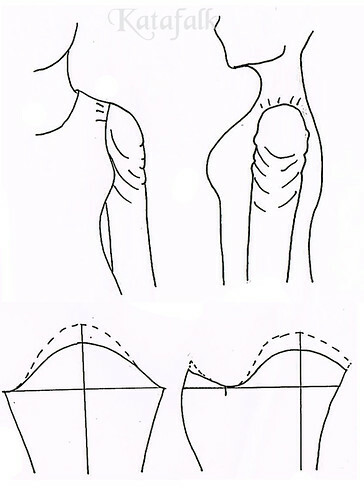 A more historical armhole sits a bit further into your body, as you can see as a dotted line on the picture below. It will give the ball of your shoulder more space and it sits tight up in your armpit. With this armhole you will feel that you can raise your arm higher without the garment is affected. A clear sign of a to low sleeve cap is that some kind of creases in the fabric appears as the picture shows. It pulls from under the arm and if your sleeve is tight the shoulder sleeve might be pulled of the shoulder. There are a lot of positive things about a low sleeve cap and also a lot of reasons that historical sleeves have a relativity low sleeve cap. The lover your sleeve caps is the better movement your sleeve gets. The throwback is that you might have to live with the diagonal lines and pulling of the fabric and folds in the armpit. But as historical garments have a smaller armhole than a modern the result is that you will not need such a high sleeve cap. That is why you can say that the lower your sleeve cap is the more movement your sleeve gets. Keep in mind that the best movement is given in a classic “t-tunic” with a completely straight sleeve and a gore under the arm. But with that type of sleeve you will have to live with the fact that it does not sit completely smooth and pretty. The set in sleeve is a choice that you make, if you want a pretty sleeve you will have to sacrifice the movement of the sleeve and vice versa. But as long as your armhole is small you will have a greater chance of getting a pretty sleeve with a low sleeve cap, than if you choose a bigger armhole that needs a higher sleeve cap. When you have a to high sleeve cap you will notice a slim puff sleeve at the top of your shoulder. It is high and it is clear that there is to much material in the top of your armhole. 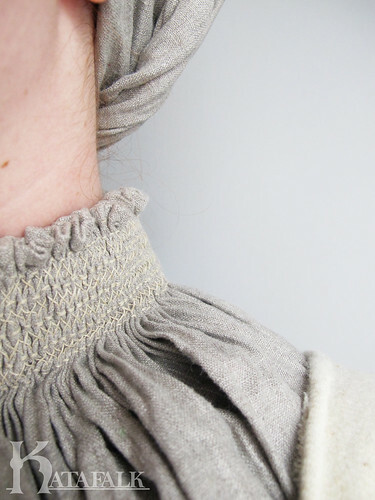 A higher sleeve cap gives you a longer piece of fabric that needs to fit in your armhole. This might cause some puckering or gathers at the top of the sleeve cap, if you did not make a wider gathered sleeve by choice this is a clear sign that something is wrong. You might want to say that a high sleeve cap always is the culprit in the drama about bad range of movement, but so is not the case. The bad range of movement is the result of a to big armhole that requires a higher sleeve cap if you wish to eliminate pulling and diagonal lines. That is why you should not talk bad about the high sleeve cap, it is there because you want a nice smooth and well put in sleeve and can most often be found on modern garments that almost always have bigger armholes than the historical garments. 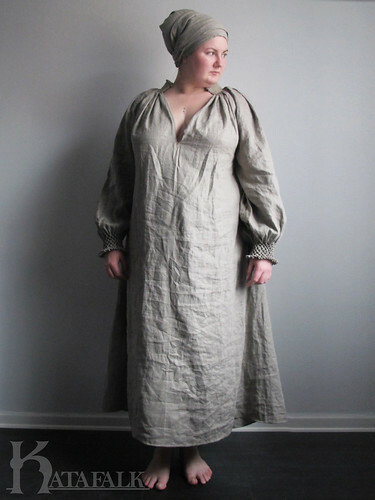 A historical armhole is always tighter against the body and smaller. It will therefore require a lower sleeve cap to get the same visual as the high sleeve cap in the modern armhole. The throwback with the modern armhole and high sleeve cap is that it will always have less range of movement then the historical one. But it is your choice, do you sacrifice looks for function or the other way around. A slim sleeve cap will give you the feeling that it pulls a lot at the top of your sleeve. This is simply because there is not enough material to cover the ball of your shoulder. So the sleeve will pull fabric from your bodice and the sleeve seam will be pulled out onto your shoulder. A modern armhole is bigger but also sits farther out on the shoulder than a historical armhole that is located on the inside of the ball of your shoulder. 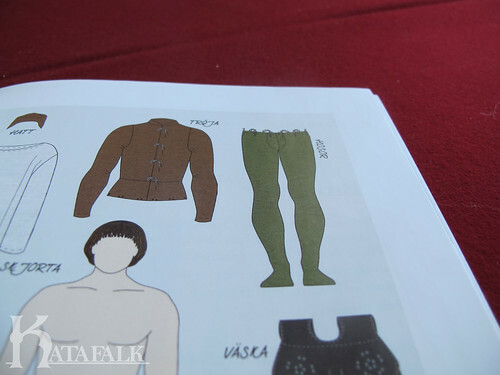 This is why a modern sleeve often have a slimmer sleeve cap than what a historical garment needs. 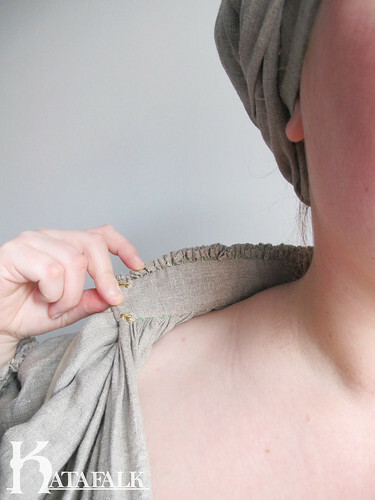 So when using a modern sleeve pattern when working on a historical garment you might end up missing an inch of fabric on your sleeve cap because the seam of the historical garment have been moved in further onto the body. If you are only missing a inch or so you can solve this with the help of an iron. Using warmth and a bit of moisture, work in circular movements on the venter of your sleeve cap and sort of knead the fabric out. This will of course only work if you are using wool, but in a fluffy wool fabric it might give you that extra inch of fabric if you are lucky. But be careful so that you do not distort the shape of your sleeve cap, remember that it is important to have a pretty shape. One way of seeing if your sleeve cap is to wide is to look at it from the side. A to wide sleeve cap might also be notice by to much ease in your sleeve cap, so that when you are trying to set your sleeve smoothly you will get some tendency for puckering or gathers. A wide sleeve cap is positive when you are making a puffed sleeve, then you need the extra width over the top of your upper arm so that the sleeve becomes not only puffy in the top but also lower down and to the sides. But this is not often what you are looking for when wanting a smoothly set sleeve. A mistake people do is to try and make it slimmer by taking away material in the seam under the arm. But is is important to look where it is puffy and only slim it down where it is needed, in this case only in the sleeve cap. To be honest I do not know the technical term for this area of the sleeve, but it is the area that is 2-3 inches beside your side seam/underarm seam. this is the area under your arm where the bodice and sleeve lays always exactly against each other. This is why it is very important that these places have the exact same shape, as they are always going to lay against each other. If they are not the same shape you will notice this as a “bubble” will form under your arm, as if it was just a few cm to much material only under your arm. This is because you are forcing the bottom of the sleeve to lay flat against a shape that is different from its own. 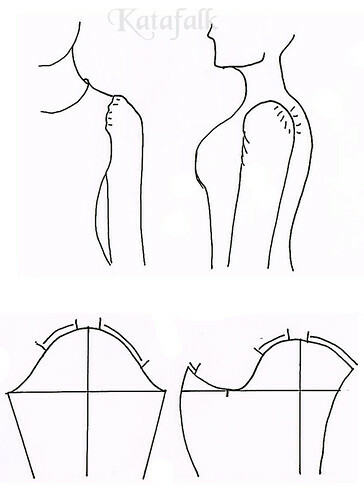 The rule is usually that you should follow the shape of the armhole of the bodice if it has a nice shape. 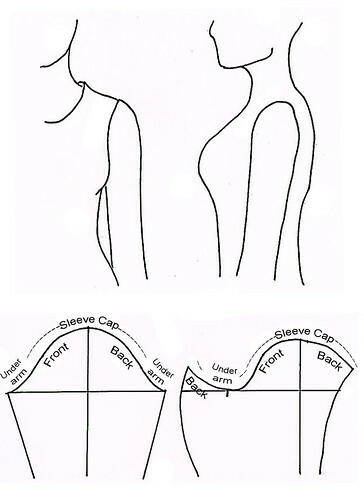 Put the sleeve pattern against your bodice pattern, front to front, trace the shape of the bottom of the sleeve of the bodice for 2-3 inches and then make sure that is connects with the sleeve cap line with a nice shape. Do the same on the other side of the sleeve, put it back to back, trace the bottom of the armhole and meet the top of the sleeve cap line in a nice shape. 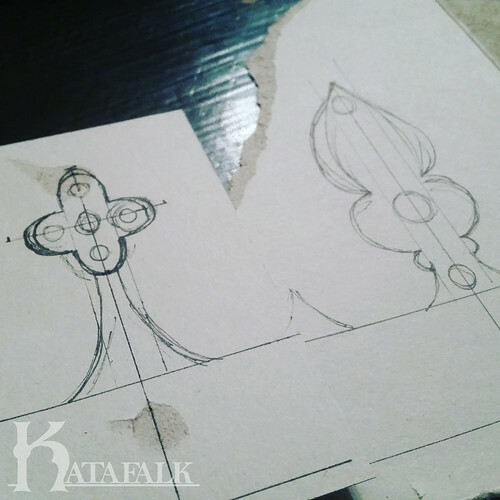 When you draw a sleeve the shape of the line is important, if it is smooth and not wobbly on the pattern the same thing will be true on the body. Does it feels that you have all this extra material on the front of your sleeve of the other way around, then you might have distributed your ease incorrectly. But what ever is ease? When you make a sleeve it needs to be a bit bigger than the armhole to be able to be put in nicely. The extra length of the seam of the sleeve needs to be eased in when you are setting your sleeve and the result is supposed to be a totally smooth sleeve without puckering or garters at the top. If you have no ease at all you might end up with your armhole looking a bit gathered. A higher sleeve cap needs more ease to sit correctly on your arm and a lower sleeve cap needs less. The result of this is that in historical garments you end up having less ease as the naturally needs less. This is because of the fact that they often have a lower sleeve cap. You can say that you need 0,4-2 inches of ease depending on the material, but you can some times squeeze in even more. 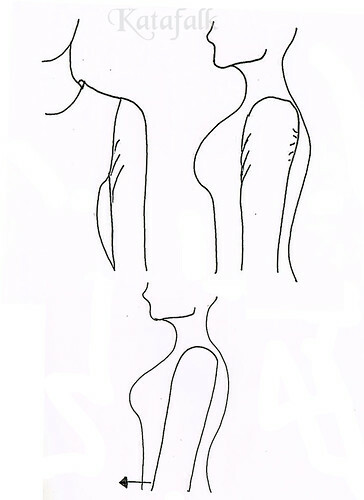 The ease is distributed differently in the front and the back of the sleeve. In the front it is concentrated over a short distance. This is because you need the extra width there so that the sleeve goes over the ball of your shoulder in a nice way without pulling. 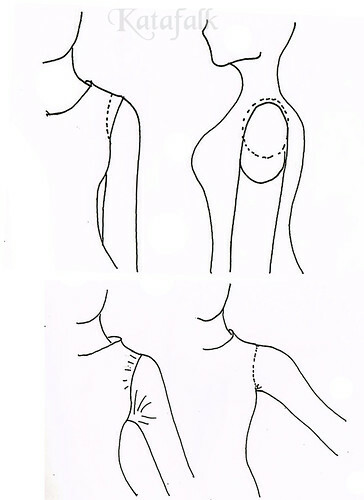 At the centre of your shoulder, 0,6 inches on each side of the shoulder seam you need no ease at all. At the back the ease is distributed over a longer distance, as you are flatter in the back of your arm. Does it pull in the back is is a lot of material in the front of the sleeve or the other way around? One might think that the problem here is incorrectly distributed ease. It does give the same kind of feeling but in this case the problem is that the sleeve have been angled in the wrong direction when it was set, in the drawing below it was angled backwards. A sleeve should be angled a bit forward to look good on the body. 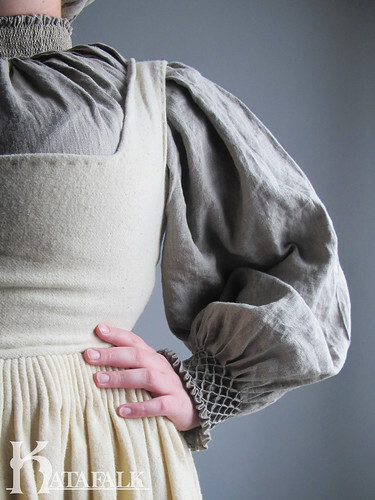 You can often see on historical garments that they often have a exaggerated forward facing sleeve. This is also often combined with a sleeve that does not fall down to the sides of the body as a modern sleeve but is bent forward already in the pattern. This might feel a bit of in the beginning when you are not used to it, but is most likely made in this way to give the prettiest sleeve when worn. If you think about it, it is not that often that you walk with your arms straight down, they are often a bit bent forward. Start by sewing the side, underarm and shoulder seams. Press them well and sew them down as you want. Put one of the armholes of the bodice over your knee with the shoulder seam facing up. So that your knee peaks out of the armhole and you can see the side seam. Put the sleeve right on top of the armhole and match the bottom up with the side seam. Make sure that you put it in the right way, the sleeve cap is always a bit more roomy in the front so that the ball of your shoulder will have room and flatter in the back. Also make sure that the sleeve is positioned right, a bit titled forward. Then baste the bottom, 2-3 inches on each side of the side seam. Turn the sleeve and garment right side out and hold it either in your hand or put it on a doll or better yet, the person you are sewing the garment for. Make sure that the sleeve falls nicely, a bit tilted forward and that the area under your arm is smooth and nice, watch out for that “bubble”. 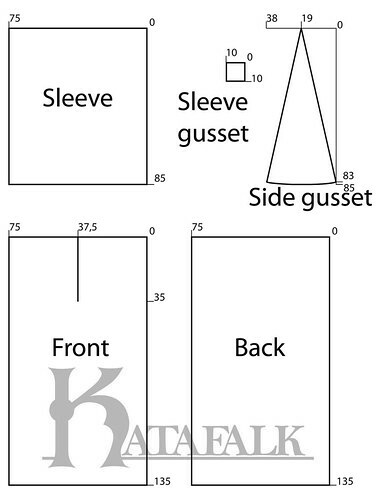 Using your hand, follow the sleeve upwards and simply lay the top of your sleeve cap against the shoulder seam. Make sure that there is no pulling in any direction and that is is straight. 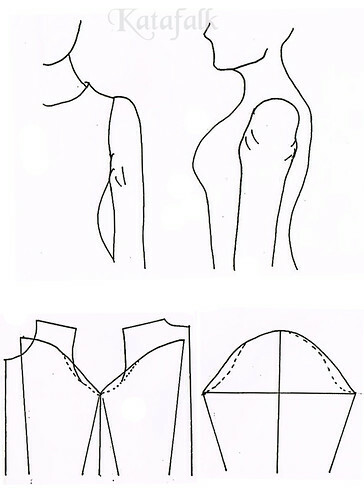 Distribute the ease on each side of the shoulder seam by all the rules in the book and baste the rest of the sleeve. Control the sleeve and adjust as needed after this guide. Then sew in the sleeve for real. I hope that this guide might help you in some way, remember, the sleeve is your friend not your enemy. I have this little game each midsummer. In Sweden we have a tradition of wearing traditional folk costumes when dancing around the maypole, at least all the old ladies are. 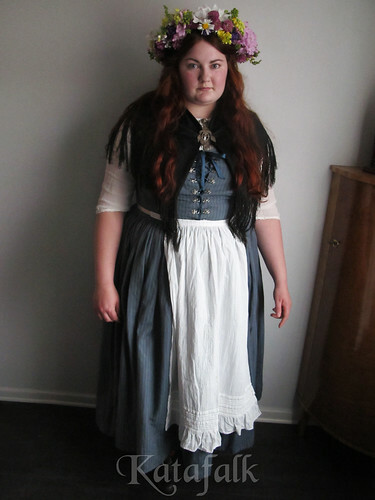 And my game is to fake a folk dress so that the old ladies asks me “were are your dress from”. 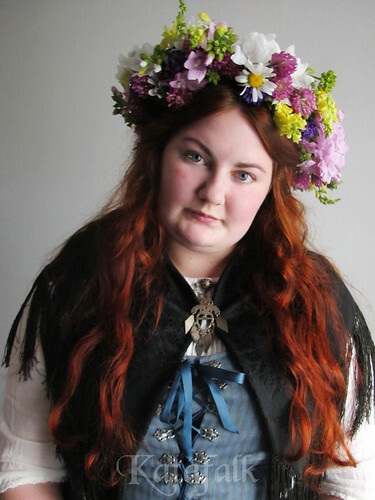 I would really like to have a “real folk costume” but the costume from the area where I am from is not that exiting and I mostly have not taken the time to make it, for that reason, I would like something a bit more elaborate or special. There are so many varieties, all from super elaborate to very simple. 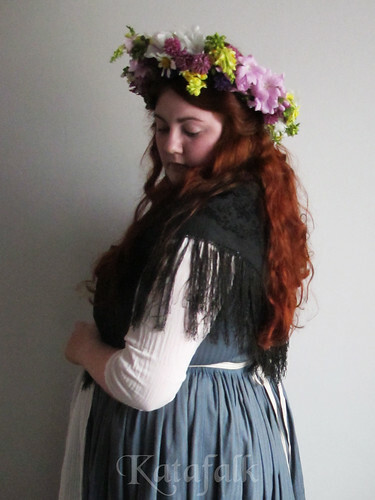 So in stead, I have aimed to make a national romanticised version of a traditional costume. What would a person living in the early 20th century have worn to look “traditional”. 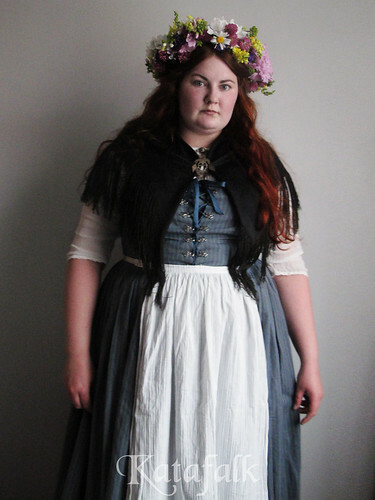 There are some things that are typical for folk costumes in general, so here comes my guide on “how to fake traditional Swedish folk wear”. A white linen or cotton blouse, this is often embroidered, either in white or with colour. The shape is almost always a historical shape. It is almost always long sleeved, but this year it was so warm so I opted on a 1910ish blouse. 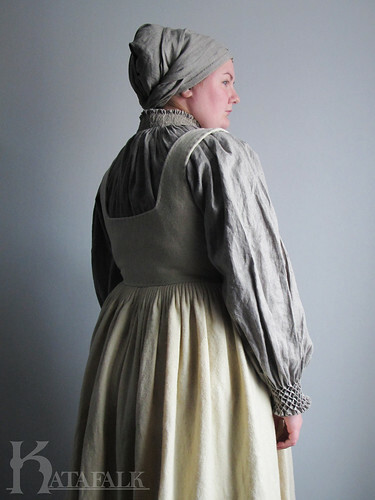 The dress echoes the rural 18th century, often sleeveless and have a pleated skirt attached. It is very often striped, there are endless varieties. 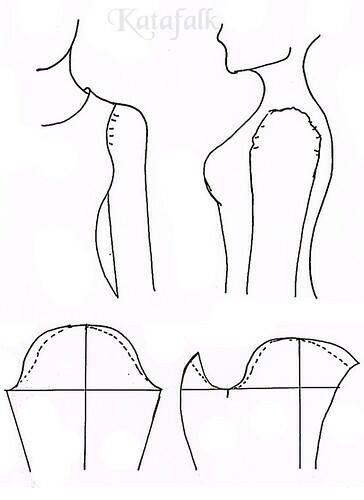 Often it is also two separate parts, bodice and skirt; the bodice laced in the front often with decorative metal eyelets. The more rich parts have more silver attached to the dress, the poorer parts have regular sewn eyelets or just hooks and eyes. The skirt length varies, but they are never full length. I made my dress in a blue striped cotton fabric, with cartridge pleated skirt and lace up front. A simple round neckline and no sleeves. 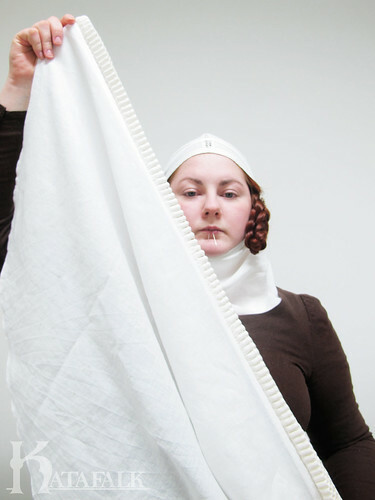 You really need to have a apron, very often embroidered, or striped and some times printed as the 18th century aprons. I used a white cotton voile apron that I have thrifted, it is perfect as it is only “for show” with its fragile fabric and narrow width. 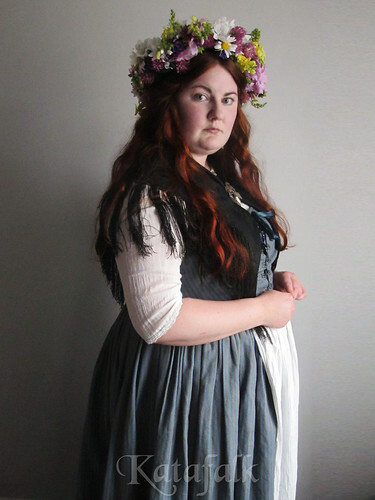 Many folk costumes have two aprons to the costume, one for more everyday wear, and one fine for party and church, the same thing goes for the shawls. Over your shoulders you wear a scarf or shawl. Embroidered or perhaps a fancy silk. I have a small collection of black silk ones, all in different patterns and with different fringes. To close it up you need some silver, the brooch I am wearing is very classical, mine is not in silver but a silver coloured metal, these can go very fancy, I am also wearing a silver brooch of another type at my neck. Red socks and 18th century:ish shoes, a typical folk wear look. Mine are in silk but very often they are in wool, white and grey are also common. Here is when I add the national romantic vibe. 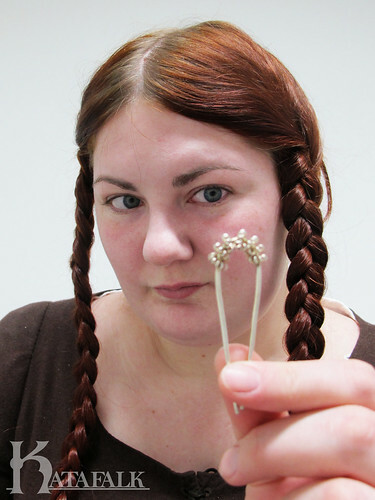 For a traditional costume only very young girls wear their hair loose. 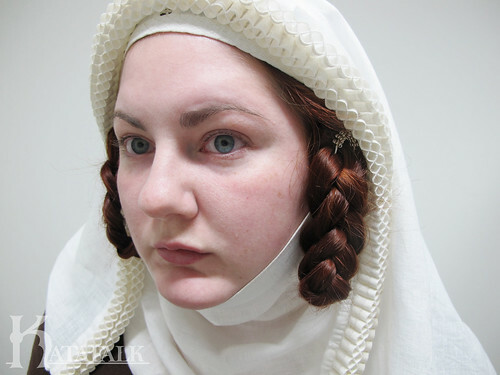 You should really put your hair in braids or wear it with a traditional small silk hat, lace or veils. 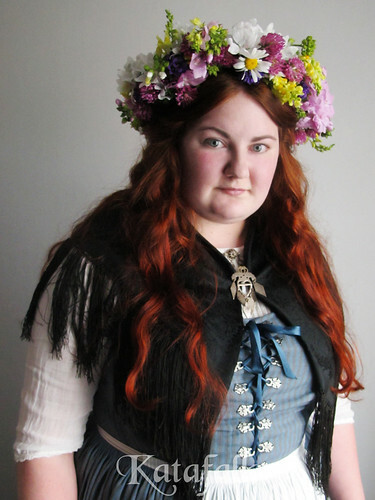 I wear my hair loose and top it with the midsummers flower crown. I like mine big and made out of wild flowers, not cultivated but found by the side of the road. The week before midsummer I scout the ditches on the way home from work. 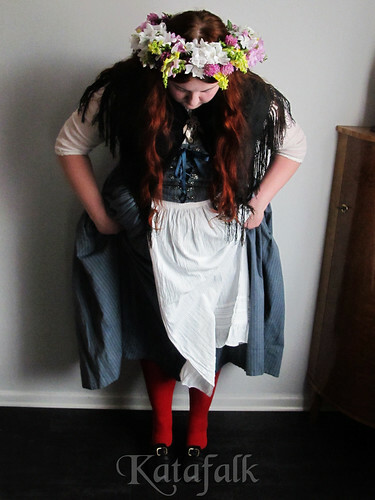 So that is what I do, my quick guide on how to fake a traditional Swedish folk costume.